I’m taking a break today from blogging about real estate and instead am going to blog about a popular new San Francisco app. 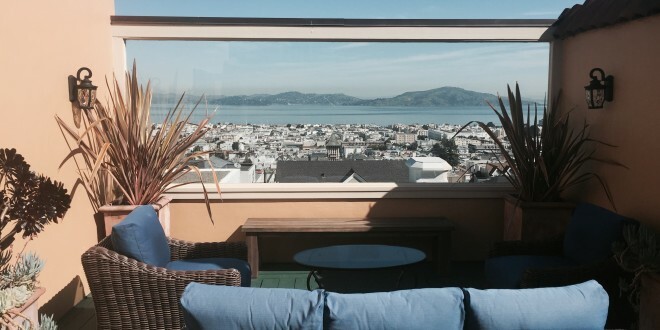 However, first I want to share a picture of my favorite roof deck view this week on Broker’s Tour (pictured above). It is from the roof of a home at 2627 Steiner Street. It’s a nicely sheltered space with a heavenly view. I just saw this article in the NYTimes about a new app called, “Down to Lunch.” According to the article, “The app … is shockingly old-fashioned: It’s all about meeting up with your friends in person. You send a message to some or all of your buddies saying that you have free time and are looking for company for a meal, a gym workout, even a church service. Whoever is interested responds and you arrange to meet.” Really? How about sending a text, an email or giving them a call? Do you really need an app to set up a meeting with your friends? Previous: Why Pricing It Right Is So Important! Next: A Room With A View!